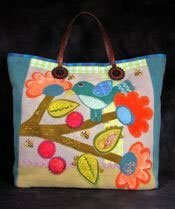 "This funky design features a textured bird on an embellished tree branch, layered leaves, flowers, and berries. Construction of the tote utilizes layering of wools, velvets and cotton fabrics to create fun dimension and texture." This was designed as a tote, but you could also use it for a pillow or small wallhanging. Great beginner class! 2nd Mon, 9:00 a.m. - noon, Jan-June, 2019, Judy Cummings, $120 for six classes, supply list. CLASS IS FULL. Note: April class will be April 15, not April 8.